Well, that's a problem for the history of the hobby. Conrad Eschenberg was an OA dealer that was set up at every major show for many many years along with Bechara, Albert, Anthony, etc. He was touting Kirby art for over a decade (and priced his art accordingly!) and was passionate about it, but eventually developed Parkinson's and had to step away from the hobby. As with any of these characters, there were good stories and bad. I don't have the time or inclination to share all of these stories but I'll share a favorite story from a visit. He once owned the complete Swamp Thing story from House of Secrets #92. But what was so special about this complete issue was that he also had the original envelope that also contained original photographs that Berni (or one of the other members of The Studio) must've taken in (I believe) Berni's apartment. These photos were of Berni and other members of the studio and Len's future wife in the exact poses that were used in many of the origin panels. So basically, based on these photos, Berni had drawn these photos as panels in the story. This was not only a revelation in the development of the story, but fascinating to see on top of going through the complete story together. Such is the hobby, I knew that story would be broken up (and it was within the year after I saw this) and those pictures would be "gone to the wind" so to speak, though I'm sure someone still has them. Someone from the next cohort of collectors has to pick up the gauntlet from the last one and if these stories are not passed down, I fear that a lot of fiction will become fact. There is an extremely rich history to this hobby but if these stories are not passed down ... then I think thats a very sad direction that the hobby has taken. Felix Wu has provided an avenue for doing this via his podcast series. I'd say the onus is on those with the oral history to come forward and share. I have no doubt you'd find an audience eager to listen. Joe Shuster - Origin Artwork to Superman Daily No 1, circa 1930s, pen and ink on Craftint paper, the surviving three panel section of the original art from Jerry Siegel's and Joe Shuster's historic first Superman daily. This unused artwork is the only known and earliest surviving example from the first series of dailies. Originally it consisted of a five-panel sequence depicting the origin of Superman. Panels No. 2 and No. 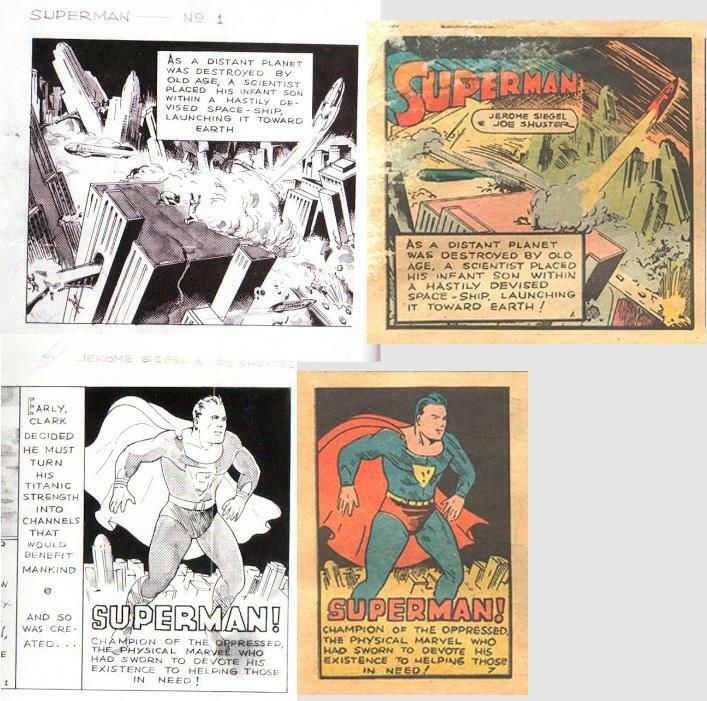 3 were long ago cut and removed, and by all indications, may have been used in pasting up the first page to Action Comics No. 1 in 1938. The first panel of the strip depicts the planet Krypton exploding as a spaceship (containing the son of Lora and Jor-l (sic)) rockets into space. My memory is not what it was which is why I wrote "I believe..." But I think if you compared the panels with a page from Action #1 you would see that the panels are the same. Whether or not they were redrawn is unknown. I'm not even sure Sotheby's knew exactly what they had when they auctioned it - if you read the description in the catalogue its rather vague. I'm not even sure the reference of it being unpublished is referencing that the strip was unpublished or the panels themselves. If they were unpublished so be it - but I believe the reason the lot didn't sell at the time is because there was a lot of uncertainty and confusion as to what this actually was. The lot also came with a piece of paper where it appeared that the character of Superman was being fleshed out. Yes his podcast series is excellent as is Vincent Zurzolo's podcast from years earlier (that is/was available on Metropolis' website) that covers an expansive list of guests that can provide an abundance of history. I believe that going to shows and meeting fellow collectors and asking to hear the stories is also a fantastic way to learn about the history of the hobby. Many people are private and do not wish to share these stories publicly (or have little interest in being public themselves) but the more welcoming this forum is, the more likely people will be to share IMHO. As I read the description, there was a five panel origin strip. Panels 2 and 3 are missing, thought to have been pasted up on the (no doubt lost) Action 1 boards. Sotheby auctioned the unused, unpublished, discarded panels 1, 4 and 5. I have pics of 1 and 5. Comparison to Action 1 shows these panels were redrawn, somewhat more crudely and with minor changes, for the comic. Yes. That’s an accurate description of what you’re doing. My premise isn’t false, and has yet to be falsified. So I am not making an a priori argument. You are. 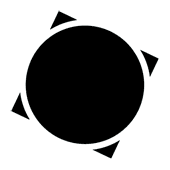 You argue they don’t exist, but have no proof other than that they haven’t surfaced, or were not recorded some 13 years after their creation when first inventoried. We know the covers existed at one point. We know the interiors survived. We know that you don’t need the OA to make reprints, so that explanation for why the interiors survived has been falsified. The next question is why the interiors were saved, but the covers were not. Since “future reproduction” has been eliminated as a reason, there must be another. We also know plenty of people had access to those covers and they could have been saved. We also know that if they survived, the current owners have some serious legal splainin’ to do, which may explain why they have not surfaced. So, again, you’re the one trying to rationalize your theory that they no longer exist, without any evidence except absence, which can be explained. Check out the calves! Full gladiator! Looking at both panels from the strip and Action #1 I still have a hard time seeing how these are not the same. First of all a lot of detail can be lost from the original to a printing plate/on the page. Also significant elements of both are still present. I doubt they were redrawn. Maybe traced by an assistant or stated? Who knows. Look at the line work on Superman’s left arm. The outline of that shape above his hand is still present and wouldn’t make sense to be there if the picture was completely redrawn. None of us were in the room when the first page was cobbled together and there’s enough ‘there’ there to open this up to debate. I think the mystery adds a richness to the history which is so prevalent with the origins of these characters. Vincent Zurzolo's podcast from years earlier (that is/was available on Metropolis' website) that covers an expansive list of guests that can provide an abundance of history. "National Publications was looking for a hit to accompany their success with Detective Comics, and did not have time to solicit new material. Jack Liebowitz, co-owner of National Publications, told editor Vin Sullivan to create their fourth comic book. Because of the tight deadline, Sullivan was forced to make it out of inventory and stockpile pages. He found a number of adventurer stories, but needed a lead feature. Sullivan asked former coworker Sheldon Mayer if he could help. Mayer found the rejected Superman comic strips, and Sullivan told Siegel and Shuster that if they could paste them into 13 comic book pages, he would buy them." These appear not to be simply copied, but completely redrawn, and certainly not traced. Angles, structure and shapes (both positive and negative), are all different. Not only that, but many details were clearly changed. I love hearing your stories, please keep them coming. I think it was Louise Simonson (Walt Simonson's future wife) used as the model for HOS #92 though. Legal splainin' is bs too...the statute of limitations is so very long expired. Ever watch Law & Order? How about doing some jurisdictional research into NY and NJ law on stolen property and the like, gather some facts, before running off at the mouth (or not, your choice, but know the rest of us will giggle in delight at your general naivete and ignorance of anything approaching logic!) PUH-LEAZE. In matters of law, while there is some grey areas of interpretation (by design), the big stuff (statues of limitations, whether complaints were ever filed or notices ever given, when clocks begin ticking, all that) are matters of fact. You definitely can't play the what if? games you so prefer here, not on matters of law. 2015 thread - Which is worth more, the MH Action 1 or the Action 1 cover OA if it exists? My thoughts in that subject. It depends, I think, on which item sells first. If the MH Action #1 was sold first, bringing in - say - $5 million, and then the Action #1 authenticated cover was revealed, and was put on the market with a skilfull marketing campaign (which referenced the sale of the MH copy for $5 million), I can see the Action #1 cover going for more. I think the cover being revealed - after a $5 million comic sale - would get a lot of attention and publicity. And the people who want it would not just be those who collect comics or OA, but a lot of people who just love the pop culture and what the cover represents. A better reply than I'm used to, above. Good. Two things: where are all the originals that weren't still with Marvel in 1974? What about gifts and other distributions that went to non-hobby hands pre-1974? One man's gift can be another man's (inheritors) garbage. None of this stuff had any market value presence pre-1980s and probably for those not "into" comics, until at least the Sotheby's and Christie's auctions. If one wasn't inclined to get CBG and wasn't attending San Diego or Chicago cons...as a random executive that Stan signed a contact with and gifted a cover to...you wouldn't know that a b/w piece of paper was any special at all. As easily kept as not. Or given to your kid to "color"! Jim Shooter. And everybody else that's ever gone on the record...never assume there isn't a single liar in the bunch. Follow the money. 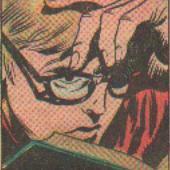 Glen Gold is unlikely to lie, while Shooter, Gil Kane, Marv Wolfman, et al, would be more likely to lie. Especially as, back in the day when it wasn't forty and fifty year old topic of conversation, industry careers at one or the other of the Big Two were on the line. Nobody in that position is rushing to admit they stole from the company! Occam's Razor.